A nobleman named Boris Godunov acted as regent and ruled from behind the scenes. 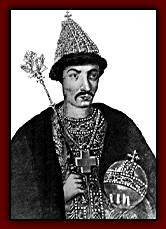 When Fedor died in 1598, Godunov was elected to rule by a special gathering, called the zemskii sobor (landed council). Boris Godunov was a reform-minded ruler, but his short reign (1598-1605) was plagued by famines, which took thousands of lives, and by the suspicion that he was not legitimate.